The MS Maribelle is docked along the Quai Gambetta, with the Pont St-Laurent up ahead. Chalon is the starting point of Viking's southbound "French Vineyards & Vistas" cruise itinerary along the Sa�ne and Rh�ne Rivers. Note: The MS Maribelle alternates between southbound and northbound cruises. 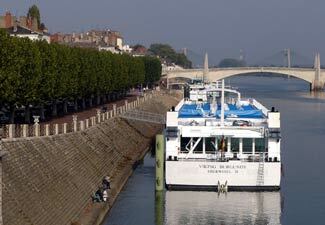 Our southbound cruise began in Chalon and ended in Avignon; northbound or upriver cruises do the itinerary in reverse.